Boltzmann's constant, and therefore entropy, have dimensions of energy divided by temperature, which has a unit of joules per kelvin (J⋅K−1) in the International System of Units (or kg⋅m2⋅s−2⋅K−1 in terms of base units). The entropy of a substance is usually given as an intensive property—either entropy per unit mass (SI unit: J⋅K−1⋅kg−1) or entropy per unit amount of substance (SI unit: J⋅K−1⋅mol−1). There are two related definitions of entropy: the thermodynamic definition and the statistical mechanics definition. Historically, the classical thermodynamics definition developed first. 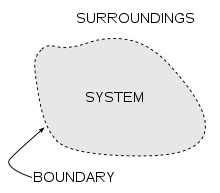 In the classical thermodynamics viewpoint, the system is composed of very large numbers of constituents (atoms, molecules) and the state of the system is described by the average thermodynamic properties of those constituents; the details of the system's constituents are not directly considered, but their behavior is described by macroscopically averaged properties, e.g. temperature, pressure, entropy, heat capacity. The early classical definition of the properties of the system assumed equilibrium. The classical thermodynamic definition of entropy has more recently been extended into the area of non-equilibrium thermodynamics. Later, the thermodynamic properties, including entropy, were given an alternative definition in terms of the statistics of the motions of the microscopic constituents of a system — modeled at first classically, e.g. Newtonian particles constituting a gas, and later quantum-mechanically (photons, phonons, spins, etc.). The statistical mechanics description of the behavior of a system is necessary as the definition of the properties of a system using classical thermodynamics becomes an increasingly unreliable method of predicting the final state of a system that is subject to some process. The Carnot cycle and efficiency are useful because they define the upper bound of the possible work output and the efficiency of any classical thermodynamic system. Other cycles, such as the Otto cycle, Diesel cycle and Brayton cycle, can be analyzed from the standpoint of the Carnot cycle. Any machine or process that converts heat to work and is claimed to produce an efficiency greater than the Carnot efficiency is not viable because it violates the second law of thermodynamics. For very small numbers of particles in the system, statistical thermodynamics must be used. The efficiency of devices such as photovoltaic cells requires an analysis from the standpoint of quantum mechanics. The statistical definition was developed by Ludwig Boltzmann in the 1870s by analyzing the statistical behavior of the microscopic components of the system. Boltzmann showed that this definition of entropy was equivalent to the thermodynamic entropy to within a constant factor which has since been known as Boltzmann's constant. In summary, the thermodynamic definition of entropy provides the experimental definition of entropy, while the statistical definition of entropy extends the concept, providing an explanation and a deeper understanding of its nature. is the matrix logarithm. This density matrix formulation is not needed in cases of thermal equilibrium so long as the basis states are chosen to be energy eigenstates. For most practical purposes, this can be taken as the fundamental definition of entropy since all other formulas for S can be mathematically derived from it, but not vice versa. Thermodynamic entropy is an extensive property, meaning that it scales with the size or extent of a system. In many processes it is useful to specify the entropy as an intensive property independent of the size, as a specific entropy characteristic of the type of system studied. Specific entropy may be expressed relative to a unit of mass, typically the kilogram (unit: J⋅kg−1⋅K−1). Alternatively, in chemistry, it is also referred to one mole of substance, in which case it is called the molar entropy with a unit of J⋅mol−1⋅K−1. Thus, when one mole of substance at about 5000000000000000000♠0 K is warmed by its surroundings to 7002298000000000000♠298 K, the sum of the incremental values of qrev/T constitute each element's or compound's standard molar entropy, an indicator of the amount of energy stored by a substance at 7002298000000000000♠298 K. Entropy change also measures the mixing of substances as a summation of their relative quantities in the final mixture. Entropy is equally essential in predicting the extent and direction of complex chemical reactions. For such applications, ΔS must be incorporated in an expression that includes both the system and its surroundings, ΔSuniverse = ΔSsurroundings + ΔS system. This expression becomes, via some steps, the Gibbs free energy equation for reactants and products in the system: ΔG [the Gibbs free energy change of the system] = ΔH [the enthalpy change] − T ΔS [the entropy change]. where T is the absolute thermodynamic temperature of the system at the point of the heat flow. If there are mass flows across the system boundaries, they also influence the total entropy of the system. This account, in terms of heat and work, is valid only for cases in which the work and heat transfers are by paths physically distinct from the paths of entry and exit of matter from the system. is the temperature at the jth heat flow port into the system. is the ideal gas constant. These equations also apply for expansion into a finite vacuum or a throttling process, where the temperature, internal energy and enthalpy for an ideal gas remain constant. Following on from the above, it is possible (in a thermal context) to regard lower entropy as an indicator or measure of the effectiveness or usefulness of a particular quantity of energy. This is because energy supplied at a high temperature (i.e. with low entropy) tends to be more useful than the same amount of energy available at a lower temperature. Mixing a hot parcel of a fluid with a cold one produces a parcel of intermediate temperature, in which the overall increase in entropy represents a "loss" which can never be replaced.
. A simple but important result within this setting is that entropy is uniquely determined, apart from a choice of unit and an additive constant for each chemical element, by the following properties: It is monotonic with respect to the relation of adiabatic accessibility, additive on composite systems, and extensive under scaling. In Hermeneutics, Arianna Béatrice Fabbricatore has used the term entropy relying on Umberto Eco works, to identify and assess the lost of meaning between the verbal description of dance and the [[choreotext]] (the moving silk engaged by the dancer when he puts into action the choreographic writing) generated by inter-semiotic translation operations.. This use is linked to the notions of logotext and choreotext. In the transition from logotext to choreotext it is possible to identify two typologies of entropy: the first, called "natural", is related to the uniqueness of the performative act and its ephemeral character. The second is caused by "voids" more or less important in the logotext (ie the verbal text that reflects the action danced ). ^ The overdots represent derivatives of the quantities with respect to time. ^ "Carnot, Sadi (1796–1832)". Wolfram Research. 2007. Retrieved 24 February 2010. ^ McCulloch, Richard, S. (1876). Treatise on the Mechanical Theory of Heat and its Applications to the Steam-Engine, etc. D. Van Nostrand. ^ a b Clausius, Rudolf (1850). On the Motive Power of Heat, and on the Laws which can be deduced from it for the Theory of Heat. Poggendorff's Annalen der Physick, LXXIX (Dover Reprint). ISBN 978-0-486-59065-3. ^ The scientific papers of J. Willard Gibbs in Two Volumes. 1. Longmans, Green, and Co. 1906. p. 11. Retrieved 26 February 2011. ^ J. A. McGovern, "2.5 Entropy". Archived from the original on 23 September 2012. Retrieved 5 February 2013. ^ "6.5 Irreversibility, Entropy Changes, and Lost Work". web.mit.edu. Retrieved 21 May 2016. ^ Lower, Stephen. "What is entropy?". www.chem1.com. Retrieved 21 May 2016. ^ Lavenda, Bernard H. (2010). "2.3.4". A new perspective on thermodynamics (Online-Ausg. ed.). New York: Springer. ISBN 978-1-4419-1430-9. ^ Carnot, Sadi Carnot (1986). Fox, Robert (ed.). Reflexions on the motive power of fire. New York, NY: Lilian Barber Press. p. 26. ISBN 978-0-936508-16-0. ^ Truesdell, C. (1980). The tragicomical history of thermodynamics 1822–1854. New York: Springer. pp. 78–85. ISBN 978-0-387-90403-0. ^ Clerk Maxwel, James (2001). Pesic, Peter (ed.). Theory of heat. Mineola: Dover Publications. pp. 115–158. ISBN 978-0-486-41735-6. 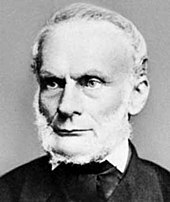 ^ Rudolf Clausius (1867). The Mechanical Theory of Heat: With Its Applications to the Steam-engine and to the Physical Properties of Bodies. J. Van Voorst. p. 28. ISBN 978-1-4981-6733-8. ^ Clausius, Rudolf (1865). "Ueber verschiedene für die Anwendung bequeme Formen der Hauptgleichungen der mechanischen Wärmetheorie (Vorgetragen in der naturforsch. Gesellschaft zu Zürich den 24. April 1865)". Annalen der Physik und Chemie. 125 (7): 353–400. Bibcode:1865AnP...201..353C. doi:10.1002/andp.18652010702. "Sucht man für S einen bezeichnenden Namen, so könnte man, ähnlich wie von der Gröſse U gesagt ist, sie sey der Wärme- und Werkinhalt des Körpers, von der Gröſse S sagen, sie sey der Verwandlungsinhalt des Körpers. Da ich es aber für besser halte, die Namen derartiger für die Wissenschaft wichtiger Gröſsen aus den alten Sprachen zu entnehmen, damit sie unverändert in allen neuen Sprachen angewandt werden können, so schlage ich vor, die Gröſse S nach dem griechischen Worte ἡ τροπὴ, die Verwandlung, die Entropie des Körpers zu nennen. Das Wort Entropie habei ich absichtlich dem Worte Energie möglichst ähnlich gebildet, denn die beiden Gröſsen, welche durch diese Worte benannt werden sollen, sind ihren physikalischen Bedeutungen nach einander so nahe verwandt, daſs eine gewisse Gleichartigkeit in der Benennung mir zweckmäſsig zu seyn scheint." (p. 390). ^ Atkins, Peter; Julio De Paula (2006). Physical Chemistry, 8th ed. Oxford University Press. p. 79. ISBN 978-0-19-870072-2. ^ Engel, Thomas; Philip Reid (2006). Physical Chemistry. Pearson Benjamin Cummings. p. 86. ISBN 978-0-8053-3842-3. ^ a b c Licker, Mark D. (2004). McGraw-Hill concise encyclopedia of chemistry. New York: McGraw-Hill Professional. ISBN 978-0-07-143953-4. ^ a b Sethna, James P. (2006). Statistical mechanics : entropy, order parameters, and complexity ([Online-Ausg.]. ed.). Oxford: Oxford University Press. p. 78. ISBN 978-0-19-856677-9. ^ Clark, John O.E. (2004). The essential dictionary of science. New York: Barnes & Noble. ISBN 978-0-7607-4616-5. ^ Schroeder, Daniel V. (2000). An introduction to thermal physics ([Nachdr.] ed.). San Francisco, CA [u.a. ]: Addison Wesley. p. 57. ISBN 978-0-201-38027-9. ^ "EntropyOrderParametersComplexity.pdf www.physics.cornell.edu" (PDF). Retrieved 17 August 2012. ^ "Jaynes, E. T., "The Gibbs Paradox," In Maximum Entropy and Bayesian Methods; Smith, C. R; Erickson, G. J; Neudorfer, P. O., Eds; Kluwer Academic: Dordrecht, 1992, pp. 1–22" (PDF). Retrieved 17 August 2012. ^ a b Sandler, Stanley I. (2006). Chemical, biochemical, and engineering thermodynamics (4th ed.). New York: John Wiley & Sons. p. 91. ISBN 978-0-471-66174-0. ^ Simon, Donald A. McQuarrie; John D. (1997). Physical chemistry : a molecular approach (Rev. ed.). Sausalito, Calif.: Univ. Science Books. p. 817. ISBN 978-0-935702-99-6. ^ Haynie, Donald, T. (2001). Biological Thermodynamics. Cambridge University Press. ISBN 978-0-521-79165-6. ^ Daintith, John (2005). A dictionary of science (5th ed.). Oxford: Oxford University Press. ISBN 978-0-19-280641-3. ^ de Rosnay, Joel (1979). The Macroscope – a New World View (written by an M.I.T.-trained biochemist). Harper & Row, Publishers. ISBN 978-0-06-011029-1. ^ McGovern, J. A. "Heat Capacities". Archived from the original on 19 August 2012. Retrieved 27 January 2013. ^ Ben-Naim, Arieh (21 September 2007). "On the So-Called Gibbs Paradox, and on the Real Paradox" (PDF). Entropy. 9 (3): 132–136. Bibcode:2007Entrp...9..132B. doi:10.3390/e9030133. ^ Daintith, John (2005). Oxford Dictionary of Physics. Oxford University Press. ISBN 978-0-19-280628-4. ^ Saha, Arnab; Lahiri, Sourabh; Jayannavar, A. M. (2009). "Entropy production theorems and some consequences". Physical Review E. 80 (1): 1–10. arXiv:0903.4147. Bibcode:2009PhRvE..80a1117S. doi:10.1103/PhysRevE.80.011117. ^ Martyushev, L. M.; Seleznev, V. D. (2014). "The restrictions of the maximum entropy production principle". Physica A: Statistical Mechanics and its Applications. 410: 17–21. arXiv:1311.2068. Bibcode:2014PhyA..410...17M. doi:10.1016/j.physa.2014.05.014. ^ Onsager, Lars (1931). "Reciprocal Relations in Irreversible Processes". Phys. Rev. 37 (4): 405. Bibcode:1931PhRv...37..405O. doi:10.1103/PhysRev.37.405. ^ Kleidon, A.; et., al. (2005). Non-equilibrium Thermodynamics and the Production of Entropy. Heidelberg: Springer. ^ Belkin, Andrey; et., al. (2015). "Self-assembled wiggling nano-structures and the principle of maximum entropy production". Scientific Reports. 5: 8323. Bibcode:2015NatSR...5E8323B. doi:10.1038/srep08323. PMC 4321171. PMID 25662746. ^ a b Moore, J. W.; C. L. Stanistski; P. C. Jurs (2005). Chemistry, The Molecular Science. Brooks Cole. ISBN 978-0-534-42201-1. ^ Jungermann, A.H. (2006). "Entropy and the Shelf Model: A Quantum Physical Approach to a Physical Property". Journal of Chemical Education. 83 (11): 1686–1694. Bibcode:2006JChEd..83.1686J. doi:10.1021/ed083p1686. ^ Levine, I. N. (2002). Physical Chemistry, 5th ed. McGraw-Hill. ISBN 978-0-07-231808-1. ^ Late Nobel Laureate Max Born (8 August 2015). Natural Philosophy of Cause and Chance. BiblioLife. pp. 44, 146–147. ISBN 978-1-298-49740-6. ^ Haase, R. (1971). Thermodynamics. New York: Academic Press. pp. 1–97. ISBN 978-0-12-245601-5. ^ Sandler, Stanley, I. (1989). Chemical and Engineering Thermodynamics. John Wiley & Sons. ISBN 978-0-471-83050-4. ^ "GRC.nasa.gov". GRC.nasa.gov. 27 March 2000. Retrieved 17 August 2012. ^ Franzen, Stefan. "Third Law" (PDF). ncsu.ed. ^ "GRC.nasa.gov". GRC.nasa.gov. 11 July 2008. Retrieved 17 August 2012. ^ Gribbin, John (1999). Gribbin, Mary (ed.). Q is for quantum : an encyclopedia of particle physics. New York: Free Press. ISBN 978-0-684-85578-3. ^ "Entropy: Definition and Equation". Encyclopædia Britannica. Retrieved 22 May 2016. ^ a b Brooks, Daniel R.; Wiley, E. O. (1988). Evolution as entropy : toward a unified theory of biology (2nd ed.). Chicago [etc. ]: University of Chicago Press. ISBN 978-0-226-07574-7. ^ a b Landsberg, P.T. (1984). "Is Equilibrium always an Entropy Maximum?". J. Stat. Physics. 35 (1–2): 159–169. Bibcode:1984JSP....35..159L. doi:10.1007/bf01017372. ^ a b Landsberg, P.T. (1984). "Can Entropy and "Order" Increase Together?". Physics Letters. 102A (4): 171–173. Bibcode:1984PhLA..102..171L. doi:10.1016/0375-9601(84)90934-4. ^ Lambert, Frank L. "A Student's Approach to the Second Law and Entropy". entropysite.oxy.edu. Archived from the original on 17 July 2009. Retrieved 22 May 2016. ^ Watson, J.R.; Carson, E.M. (May 2002). "Undergraduate students' understandings of entropy and Gibbs free energy" (PDF). University Chemistry Education. 6 (1): 4. ISSN 1369-5614. ^ Lambert, Frank L. (February 2002). "Disorder – A Cracked Crutch for Supporting Entropy Discussions". Journal of Chemical Education. 79 (2): 187. Bibcode:2002JChEd..79..187L. doi:10.1021/ed079p187. ^ Atkins, Peter (1984). The Second Law. Scientific American Library. ISBN 978-0-7167-5004-8. ^ Sandra Saary (23 February 1993). "Book Review of "A Science Miscellany"". Khaleej Times. Galadari Press, UAE: XI. ^ Lathia, R; Agrawal, T; Parmar, V; Dobariya, K; Patel, A (20 October 2015). "Heat Death (The Ultimate Fate of the Universe)". doi:10.13140/rg.2.1.4158.2485. ^ Lieb, Elliott H.; Yngvason, Jakob (March 1999). "The physics and mathematics of the second law of thermodynamics". Physics Reports. 310 (1): 1–96. arXiv:cond-mat/9708200. Bibcode:1999PhR...310....1L. doi:10.1016/S0370-1573(98)00082-9. ^ Carathéodory, C. (September 1909). "Untersuchungen über die Grundlagen der Thermodynamik". Mathematische Annalen (in German). 67 (3): 355–386. doi:10.1007/BF01450409. ^ R. Giles (22 January 2016). Mathematical Foundations of Thermodynamics: International Series of Monographs on Pure and Applied Mathematics. Elsevier Science. ISBN 978-1-4831-8491-3. ^ Balian, Roger (2004). "Entropy, a Protean concept". In Dalibard, Jean (ed.). Poincaré Seminar 2003: Bose-Einstein condensation – entropy. Basel: Birkhäuser. pp. 119–144. ISBN 978-3-7643-7116-6. ^ Brillouin, Leon (1956). Science and Information Theory. ISBN 978-0-486-43918-1. ^ Georgescu-Roegen, Nicholas (1971). The Entropy Law and the Economic Process. Harvard University Press. ISBN 978-0-674-25781-8. ^ Chen, Jing (2005). The Physical Foundation of Economics – an Analytical Thermodynamic Theory. World Scientific. ISBN 978-981-256-323-1. ^ Kalinin, M.I. ; Kononogov, S.A. (2005). "Boltzmann's constant". Measurement Techniques. 48 (7): 632–636. doi:10.1007/s11018-005-0195-9. ^ Ben-Naim, Arieh (2008). Entropy demystified the second law reduced to plain common sense (Expanded ed.). Singapore: World Scientific. ISBN 9789812832269. ^ "Edwin T. Jaynes – Bibliography". Bayes.wustl.edu. 2 March 1998. Retrieved 6 December 2009. ^ Schroeder, Daniel V. (2000). An introduction to thermal physics ([Nachdr.] ed.). San Francisco, CA [u.a. ]: Addison Wesley. p. 88. ISBN 978-0-201-38027-9. ^ Brooks, Daniel, R.; Wiley, E.O. (1988). Evolution as Entropy– Towards a Unified Theory of Biology. University of Chicago Press. ISBN 978-0-226-07574-7. ^ Yockey, Hubert, P. (2005). Information Theory, Evolution, and the Origin of Life. Cambridge University Press. ISBN 978-0-521-80293-2. ^ Chiavazzo, Eliodoro; Fasano, Matteo; Asinari, Pietro (2013). "Inference of analytical thermodynamic models for biological networks". Physica A: Statistical Mechanics and its Applications. 392 (5): 1122–1132. Bibcode:2013PhyA..392.1122C. doi:10.1016/j.physa.2012.11.030. ^ Chiavazzo, Eliodoro; Isaia, Marco; Mammola, Stefano; Lepore, Emiliano; Ventola, Luigi; Asinari, Pietro; Pugno, Nicola Maria (2015). "Cave spiders choose optimal environmental factors with respect to the generated entropy when laying their cocoon". Scientific Reports. 5: 7611. Bibcode:2015NatSR...5E7611C. doi:10.1038/srep07611. PMC 5154591. PMID 25556697. ^ von Baeyer, Christian, H. (2003). Information–the New Language of Science. Harvard University Press. ISBN 978-0-674-01387-2. Srednicki M (August 1993). "Entropy and area". Phys. Rev. Lett. 71 (5): 666–669. arXiv:hep-th/9303048. Bibcode:1993PhRvL..71..666S. doi:10.1103/PhysRevLett.71.666. PMID 10055336. Callaway DJE (April 1996). "Surface tension, hydrophobicity, and black holes: The entropic connection". Phys. Rev. E. 53 (4): 3738–3744. arXiv:cond-mat/9601111. Bibcode:1996PhRvE..53.3738C. doi:10.1103/PhysRevE.53.3738. PMID 9964684. ^ Layzer, David (1988). Growth of Order in the Universe. MIT Press. ^ Chaisson, Eric J. (2001). Cosmic Evolution: The Rise of Complexity in Nature. Harvard University Press. ISBN 978-0-674-00342-2. ^ Lineweaver, Charles H.; Davies, Paul C. W.; Ruse, Michael, eds. (2013). Complexity and the Arrow of Time. Cambridge University Press. ISBN 978-1-107-02725-1. ^ Stenger, Victor J. (2007). God: The Failed Hypothesis. Prometheus Books. ISBN 978-1-59102-481-1. ^ Benjamin Gal-Or (1987). Cosmology, Physics and Philosophy. Springer Verlag. ISBN 978-0-387-96526-0. ^ Georgescu-Roegen, Nicholas (1971). The Entropy Law and the Economic Process (Full book accessible at Scribd). Cambridge, Massachusetts: Harvard University Press. ISBN 978-0-674-25780-1. ^ Cleveland, Cutler J.; Ruth, Matthias (1997). "When, where, and by how much do biophysical limits constrain the economic process? A survey of Nicholas Georgescu-Roegen's contribution to ecological economics". Ecological Economics. Amsterdam: Elsevier. 22 (3): 203–223. doi:10.1016/s0921-8009(97)00079-7. ^ Daly, Herman E.; Farley, Joshua (2011). Ecological Economics. Principles and Applications (PDF contains full book) (2nd ed.). Washington: Island Press. ISBN 978-1-59726-681-9. ^ Schmitz, John E.J. (2007). The Second Law of Life: Energy, Technology, and the Future of Earth As We Know It (Link to the author's science blog, based on his textbook). Norwich: William Andrew Publishing. ISBN 978-0-8155-1537-1. ^ Ayres, Robert U. (2007). "On the practical limits to substitution" (PDF). Ecological Economics. Amsterdam: Elsevier. 61: 115–128. doi:10.1016/j.ecolecon.2006.02.011. ^ Kerschner, Christian (2010). "Economic de-growth vs. steady-state economy" (PDF). Journal of Cleaner Production. Amsterdam: Elsevier. 18 (6): 544–551. doi:10.1016/j.jclepro.2009.10.019. Adam, Gerhard; Otto Hittmair (1992). Wärmetheorie. Vieweg, Braunschweig. ISBN 978-3-528-33311-9. Atkins, Peter; Julio De Paula (2006). Physical Chemistry (8th ed.). Oxford University Press. ISBN 978-0-19-870072-2. Baierlein, Ralph (2003). Thermal Physics. Cambridge University Press. ISBN 978-0-521-65838-6. Ben-Naim, Arieh (2007). Entropy Demystified. World Scientific. ISBN 978-981-270-055-1. Callen, Herbert, B (2001). Thermodynamics and an Introduction to Thermostatistics (2nd ed.). John Wiley and Sons. ISBN 978-0-471-86256-7. Chang, Raymond (1998). Chemistry (6th ed.). New York: McGraw Hill. ISBN 978-0-07-115221-1. Cutnell, John, D.; Johnson, Kenneth, J. (1998). Physics (4th ed.). John Wiley and Sons, Inc. ISBN 978-0-471-19113-1. Dugdale, J. S. (1996). Entropy and its Physical Meaning (2nd ed.). Taylor and Francis (UK); CRC (US). ISBN 978-0-7484-0569-5. Fermi, Enrico (1937). Thermodynamics. Prentice Hall. ISBN 978-0-486-60361-2. Goldstein, Martin; Inge, F (1993). The Refrigerator and the Universe. Harvard University Press. ISBN 978-0-674-75325-9. Gyftopoulos, E.P. ; G.P. Beretta (2010). Thermodynamics. Foundations and Applications. Dover. ISBN 978-0-486-43932-7. Haddad, Wassim M.; Chellaboina, VijaySekhar; Nersesov, Sergey G. (2005). Thermodynamics – A Dynamical Systems Approach. Princeton University Press. ISBN 978-0-691-12327-1. Kroemer, Herbert; Charles Kittel (1980). Thermal Physics (2nd ed.). W. H. Freeman Company. ISBN 978-0-7167-1088-2. Penrose, Roger (2005). The Road to Reality: A Complete Guide to the Laws of the Universe. New York: A. A. Knopf. ISBN 978-0-679-45443-4. Reif, F. (1965). Fundamentals of statistical and thermal physics. McGraw-Hill. ISBN 978-0-07-051800-1. Schroeder, Daniel V. (2000). Introduction to Thermal Physics. New York: Addison Wesley Longman. ISBN 978-0-201-38027-9. Serway, Raymond, A. (1992). Physics for Scientists and Engineers. Saunders Golden Subburst Series. ISBN 978-0-03-096026-0.
vonBaeyer; Hans Christian (1998). Maxwell's Demon: Why Warmth Disperses and Time Passes. Random House. ISBN 978-0-679-43342-2.